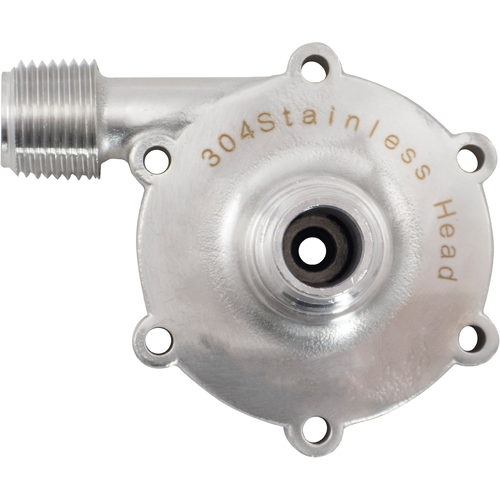 Upgrade your MKII pump with a 304 stainless steel replacement head. 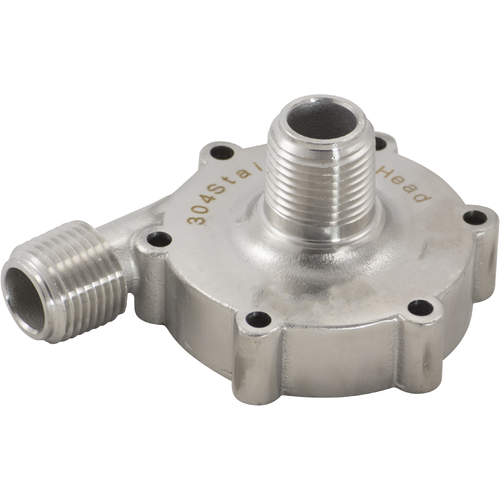 Stainless steel is more durable if you are attaching ball valves. 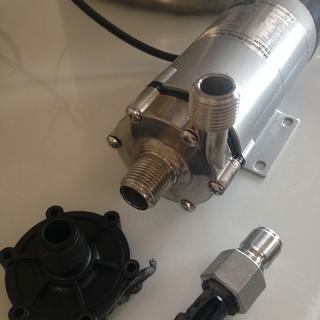 Very cccasionally the threads on the plastic head that comes standard on the MKII can break if you are using hard to close ball valves that apply a lot of torque. Stainless steel is very robust and will not break, is food grade, and well... stainless. Stainless is better than plastic! Heavy duty - just in case. 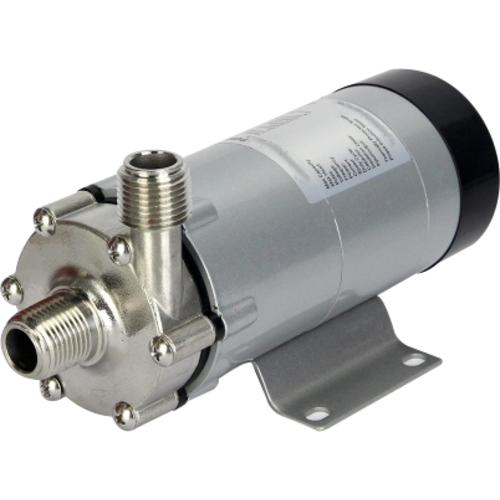 Replace the plastic head that already sees wearing away of hose mounting threads. Steel head upgrade is recommended by experienced brewers. First drop of polybisphone head makes for a replacement with a stainless steel head. As Sean Connery said when a book hit him on his head, "I only have my shelf to blame." Upgrade to existing pump. More durable, easier to clean. Because its SS and has (2) 1/2" ports instead of (1) 3/4 "& (1) 1/2"
Should have ordered this when I first got the pump. I broke the original plastic head tightening up a fitting brewday eve, really took the wind out of my sails. The pump looks much more robust now, and I suspect this will serve its purpose for quite a while, but have only used it for one brew. 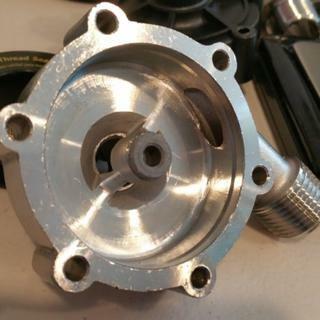 If you buy the MKII pump, buy this head as well and don't give it a second thought, the plastic one will fail at some point, just a matter of when. Nice quick switch! And now I can tighten everything down without breaking it! The original head on the MKII is not super for attaching lots of heavy stainless steel. This replacement head upgrades the weakness of the original as others have noted. In the head I received I noticed that the outlet was not polished or beveled, making for possibly difficult cleaning and sanitizing. The tiny surface scratches on the seal area do not seem to affect the seal. There was not a replacement seal included with the head but my new pump's seal looked fine. You may need to order a new seal if your pump is older. Went straight for metal head on the unit and it performs great. 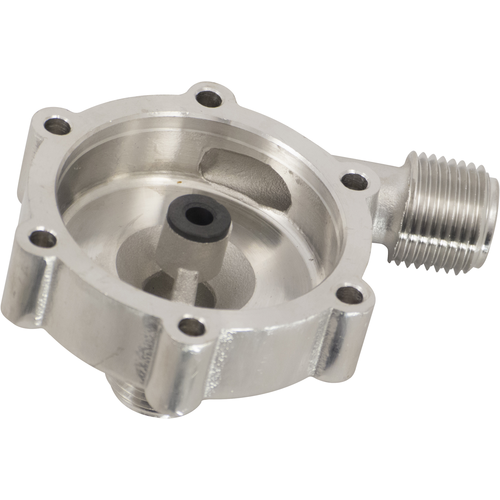 Almost worth 5 stars, but the item came with damage on the surface that mates to the o-ring on the impeller housing. I took a sheet of 320 grit sandpaper placed on my drill press table (nice flat surface) and rubbed the pump head surface down for a minute or so. You could hear the nicks and dings grinding away for the first few seconds then it went smooth. Placed it on the pump and tested it with a fully primed pump and shutting off the output with a ball valve--no leaks! This little pump ROCKS! 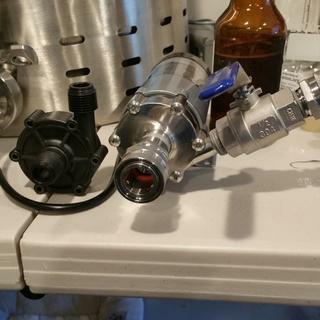 I have only tested it the pump with a bucket of water, not during a real brew day, but i don't expect any issues (but will report back if some arise).